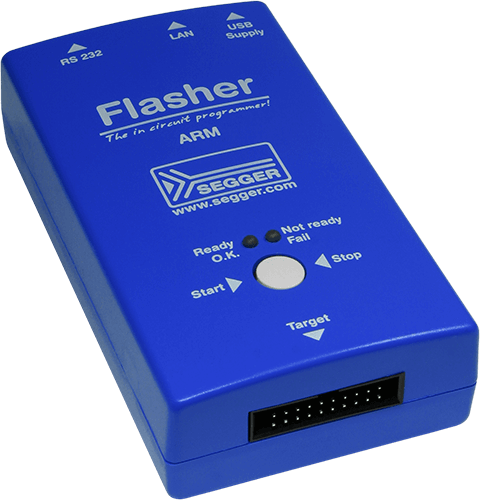 Flasher ARM connects via USB, Ethernet or via RS232 interface to a PC, running Microsoft Windows 2000, Windows XP, Windows 2003, Windows Vista, Windows 7, Windows 8 or Windows 10 and has a built-in 20-pin JTAG connector, which is compatible with the standard 20-pin connector defined by ARM. J-Flash is a software running on Windows (Windows 2000 or later) systems and enables you to program your flash EEPROM devices via the JTAG connector on your target system. J-Flash works with any device/core that is supported by J-Link and supports all common external flashes, as well as the programming of internal flash of ARM microcontrollers. It allows you to erase, fill, program, blank check, upload flash content, and view memory functions of the software with your flash devices. In order to setting up Flasher for the "stand-alone mode" it has to be in "J-Link mode". When the correct connection of Flasher to the host PC is verified start the J-Flash software. Flasher can be remote controlled by automated testers without the need of a connection to PC and Flasher's PC program. Therefore Flasher is equipped with additional hardware control functions, which are connected to the SUBD9 male connector, normally used as RS232 interface to PC.